My apologies. 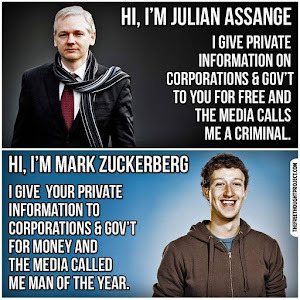 One last thing about these damn email now that Julian Assange is indicted and may be extradited to the United States after being locked up for seven years in the London embassy of Ecuador for the crime of informing the public of abuses of power by the elite as leader of WikiLeaks. Assange is indicted for trying (failing) to help his source Chelsea Manning to crack a password. Helping a source is what a journalist does and I feel that the relationship between a journalist and a source should be protected as part of the freedom of the press; this is unfortunately not the case in America, while, for instance, codified into law in Sweden. Journalists need sources to do their work. Just like your democratic right to vote should not be made into a theoretical right by making it hard to vote. It is possible to have a honest discussion on whether WikiLeaks is part of the press or whether it is a source. It has aspects of both. Nowadays major media organizations provide anonymous contact facilities similar to those of WikiLeaks. It should not matter that WikiLeaks is independent and works with multiple sources and multiple media organizations. There is one aspect where WikiLeaks is different from the press, however. Those damn emails. WikiLeaks published every single one of them in a big data dump. A journalist would only have cited those mails which are of public interest. Some email definitely were newsworthy, such as the Democratic party helping Hillary Clinton in the 2016 primaries where it was supposed to be neutral. But there was no need to publish all emails. Publishing all mails is an unacceptable violation of the right to privacy and the right to organize. In this case, they contained personal information of donors, including home addresses and Social Security numbers. Even if these had been more professionally edited out, these emails would still have done enormous collateral damage to the network of Hillary Clinton. "Whistleblowers face prosecution under the Espionage Act if they leak information of public interest to the press, while there is still no federal “shield law” guaranteeing reporters’ right to protect their sources. Journalists and their devices continue to be searched at the US border"
Blinded by their hatred for Clinton some seem to be blind to that damage. We only have rule of law when the rules are universal and one should thus try to remove any biases due to a specific case. A trick that helps me think more objectively is to switch the subjects. When the USA is killing people all over the world with drones, it helps to consider how one would feel about that when Russia, Iran or North Korea would do so. (Pick your favorite enemy country.) When the media tells you it is terrible what country or person X did, see how you feel if your country or your mom did the same. This may be the best trick I have ever learned. Tribalists may not like it. For some climate scientists may be more sympathetic than Hillary Clinton. The first big political email dump was a collection of [[emails stolen from the servers of the Climatic Research Unit (CRU)]] in the United Kingdom shortly before the international climate negotiations in Copenhagen. Cherry picking from these emails bloggers and conservative media did great damage to the public view of climate science. For example by quoting an email using the term "trick", which people interpreted as something nefarious, while in science it simply means a smart small way to compute something. All scientists involved were cleared by numerous investigations by several organizations, but by then the damage had been done. Had these emails been given to a journalistic organization, it would have investigated the situation and asked experts for advice before publishing and, in this case, likely would not have published anything. There was also much damage to the professional networks of the scientists involved. Even if a message were not private, in an email you do not express yourself like in a public statement. You write for a specific audience. If one would be forced to write everything for public consumption that would slow down everything enormously. It should be possible to get feedback on ideas in private before saying something ill-considered in public. Also in case of conflicts it is best to first try to solve this in private and not do this in public. It should be possible for me to write a colleague that I think they behaved wrongly or visa versa; that keeps our community a friendly place for all. It should also be possible to organize. For example, when there are problems with (sexual) harassment, women should be able to warn each other. It is harmful when such emails are published, especially when the accusations are not true. And it is harmful when such email are not possible. Such communications are important everywhere, whether in science, in politics or any other profession. Approving of email dumps to be published is similar to requiring everyone to communicate via a public bulletin board. I do not want to live in such a post-privacy society. It is good that newspapers have set up their own confidential and anonymous contact mechanisms, whether they be dropboxes, encrypted emails, messengers of secure FTP. I hope that whistle-blowers will use those as their first option to uncover abuses by the powerful. Writing a good article is a service to the reader. Dumping private data a danger to the public. Many Democrats and liberals are cheering Assange's arrest. That's foolish. And really disappointing. American already ranks at the bottom for press freedom among Western countries. It Is Morally Unconscionable Not To Give Chelsea Manning Clemency. The information WikiLeaks uncovered may have been inconvenient for the powerful, but was important for the public to make informed decisions. Reporters Without Borders puts the USA 45th of 180 in press freedom. Just putting the freedom of the press in the first amendment of the constitution is not enough. Because of the situation Reporters Without Borders teamed up with others to make a dedicated The U.S. Press Freedom Tracker. (Ideo)Logical Reasoning: Ideology Impairs Sound Reasoning. Would the argument still make sense if the other side made it? Manuscript. He wasn't locked up. He was there voluntarily. I might have some sympathy for Assange if he published material from whistle blowers in Russia. But, yes, it is clear they are on the side of Russia and used to be on the side of Trump. However, one of the arguments I was trying to make is that one should try to ignore such irritating information to find good rules for our society. Any news source has a bias in one direction or another. Some in a direction I do not like. Freedom of the press is still a pillar of a free society. We should try not to judge WikiLeaks, but a generic organization that helps citizens understand how the world works. Let's set up a WikiLeaks for dictatorial oil states to balance things out.